Your day-by-day itinerary now includes Gyeongdong Market, Coex Mall, Banpodaegyo Bridge, and other attractions you added. Bring the kids along to National Museum of Korea and Namsan Park. Get some cultural insight at Insadong and Bukchon. Get out of town with these interesting Seoul side-trips: Yongin (Everland & Korean Folk Village), Hwaseong Fortress (in Suwon), Petite France (in Gapyeong-gun), Gwacheon (Seoul Grand Park & Seoul Land), DMZ (in Paju) and Ilsan Lake Park (in Goyang). There's much more to do: get a taste of the local shopping with Myeongdong Shopping Street, explore the world behind art at Leeum, Samsung Museum of Art, explore the historical opulence of Gyeongbokgung Palace, and don't miss a visit to N Seoul Tower. For where to stay, traveler tips, more things to do, and more tourist information, you can read our Seoul sightseeing planner. If you are flying in from United Kingdom, the closest major airports are Gimpo International Airport, Incheon International Airport and Cheongju International Airport. In April, plan for daily highs up to 20°C, and evening lows to 6°C. Wrap up your sightseeing on the 19th (Fri) early enough to travel to Busan. Step off the beaten path and head to Gwangalli Beach and Geumjung Mt. fortress. Satisfy your inner culture vulture at Gamcheon Culture Village and Gwangbokro Culture and Fashion street. 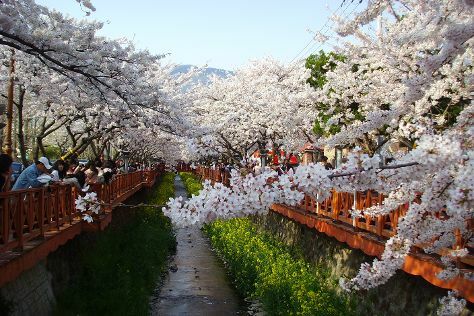 Step out of Busan to go to Changwon and see Yeojwacheon Stream, which is approximately 1:25 hours away. And it doesn't end there: kick back and relax at Haeundae Beach, browse the eclectic array of goods at Jagalchi Market, and examine the collection at Busan Museum. For reviews, where to stay, other places to visit, and tourist information, read Busan itinerary maker. You can fly from Seoul to Busan in 2.5 hours. Other options are to take a train; or drive. Traveling from Seoul in May, expect nights in Busan to be about the same, around 15°C, while days are a bit cooler, around 15°C. Cap off your sightseeing on the 22nd (Mon) early enough to travel to Jeju. Your day-by-day itinerary now includes Jeju Taxi Tour KJ as well as Eco Land Theme Park. Eschew the tourist crowds and head to Hamdeok Beach and Dongmun Market. Museum-lovers will appreciate Haenyeo Museum and Jeju Folklore & Natural Museum. Take a break from Jeju with a short trip to Jeju Folk Village in Seogwipo, about 1:20 hours away. Next up on the itinerary: witness the site of a historic battle at Seongeup Folk Village, delve into the lush surroundings at Hallasan National Park, explore the fascinating underground world of Manjanggul Cave, and admire all the interesting features of Jeju Mysterious Road. 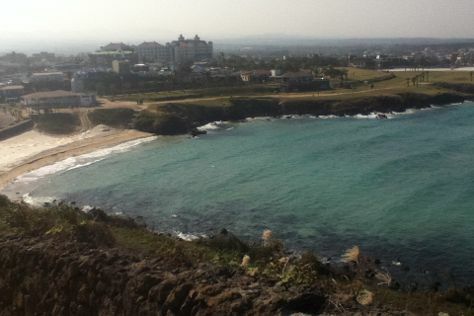 To see traveler tips, maps, where to stay, and tourist information, read Jeju travel itinerary creator. You can fly from Busan to Jeju in 2 hours. Alternatively, you can do a combination of car and ferry; or do a combination of bus and ferry. Traveling from Busan in May, you will find days in Jeju are a bit warmer (24°C), and nights are about the same (17°C). Finish your sightseeing early on the 24th (Wed) to allow enough time to travel back home.